The next RURAL TOWN HALL spotlights 2016 Presidential Candidate Carly Fiorina as she addresses issues that matter to rural Americans. Watch clips from the show, read a complete transcript of the questions and answers and find out more about presidential candidate Carly Fiorina below. A graduate of Stanford University and the University of Maryland, Carly Fiorina rose through the ranks at AT&T, eventually becoming Head of North American Field Operations before transitioning to an executive leadership role at Lucent. In 1999, she was recruited to serve as the CEO of Hewlett-Packard, becoming the first woman to lead a FORTUNE 20 company. Since leaving HP, Carly has served on the boards of several organizations. Fiorina and her husband, Frank Fiorina, live in a home in the Washington, D.C. suburb of Mason Neck, Virginia, overlooking the Potomac River. 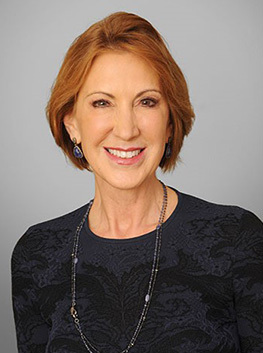 Find out more about Presidential Candidate Carly Fiorina.